Eldoret, Kenya, December 2012. Length is about 9 mm. This is a large species; many are smaller, but others are still larger. From Wikipedia: Larvae (maggots) of most members of this family are parasitoids (developing inside a living host, ultimately killing it). In contrast a few are parasitic (not generally killing the host). Tachinid larvae feed on the host tissues, either after having been injected into the host by the parent, or penetrating the host from outside. Various species have different modes of oviposition and of host invasion. Typically, Tachinid larvae are endoparasites (internal parasites) of caterpillars of butterflies and moths, or the eruciform larvae of sawflies, but some species attack adult beetles and some attack beetle larvae. Others attack various types of true bugs, and others attack grasshoppers; a few even attack centipedes. Tachinid flies are frequent visitors at flowers where they take nectar to sustain their adult activities. 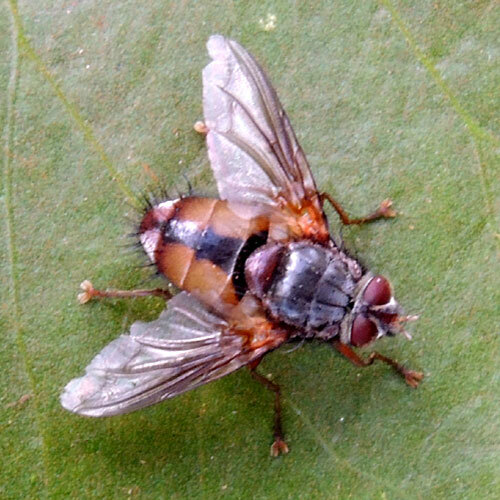 Although they look to non-experts like the sort of flies that gather about garbage, excrement and open food preparations, tachina flies are not among them. Their role as parasitoids of important crop pests mean they are mostly very beneficial to gardeners.